A leader, a healer, a lifetime friend: could you keep a donkey? Donkeys have been domesticated for more than 5,000 years – but that does not mean they are tame, biddable creatures... anything but. They have minds of their own, a rare intelligence and a need for affection and contact that belies their biting, kicking reputation. Importantly, although they are members of the horse family they are very unlike horses. 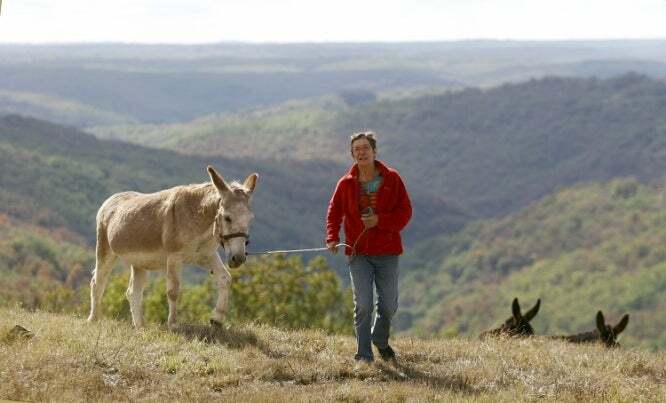 Martine Jouclas, the founder of UNAP, an association for donkey professionals, has been working with donkeys since the 80s and was one of the first to set up walking holidays with donkeys and said: “Unlike herds of wilds horses, which are constantly on the move to find new grazing, donkeys are territorial. They tend to stay in one place and will defend their territory quite aggressively, if needed. “Horses live in hierarchical groups, but donkeys depend on being in a group to survive so co-operate with each other. “Training a donkey is very different from training a horse: something like the difference between training a cat and a dog. “The dog will obey the pack leader, but the cat will only go along with another cat if it think it’s a good idea. “You cannot present yourself to a donkey as the pack leader, but only as an equal with good ideas. which can survive very well on next to nothing. In fact, overfeeding can be catastrophically bad for a donkey, leading to problems including laminitis, diabetes, heart disease and obesity.